1. In the "Pre-Columbus" period, the New Continent had already been known to the people of other continents. They had visited it and returned to their home. Therefore their experiences had been reported to other people and also recorded in trustworthy historical books. Formerly nobody would show any interest in this subject, but recently it is obtaining its credibility in the fields of historical literature and archaeology. In this paper I will elaborate upon it. 2. We can find revealing sentences in Worenzhuan*1) (a part of Sanguozhi ). "And there are Luoguo (a country where naked people live) and Heichiguo (a country where people with black teeth live). They are in the southeast of Japan. It takes one year by boat to reach them." (l) These two countries Louguo and Heichiguo existed in the third century. (2) They were located*2) in the southeast of Woguo (the northern part of Kyushu). (3) It took one year by boat to reach them. (According to the Woguo Calendar*3), this equals half a year in relation to the present one). This news was brought by Woren (a big group of ancient Japanese). A Chinese Chenshou , a chronicler official of the Xijin dynasty*4) wrote this news down in Sanguozhi , official historical books on the dynasty. I surmised these descriptions are real, and these countries were located in the northwest coast of South America ; Ecuador and Peru. I stated this view in my book*5) twenty years ago. 3. Concerning the subject mentioned above we can find other important sentences in Sanguozhi . "We (Chinese armies) proceeded into Susen areas and on the east reached Dahai (northwest of the Japan Sea, perhaps extending to the Pacific Ocean). The elders said that the strange-faced People lived in a country near where the Sun rose." In my book I supposed that (the strange-faced People) were Woren . For Woguo was situated in the east of China. But it was my error. Because in this context, "the elders" indicate the elders of Sushen (Vladiostok), Woguo (its heart was in northern Kyushu) and did not lie in the east of it. (On this point Mr. Kamata Takeshi pointed out my error at the Shirakaba Symposium). Furthermore, Woguo lay in the far west of Louguo and Heichiguo and took one year by boat. So Woguo could not be called "near where the Sun rises." From this viewpoint my old understanding was obviously incorrect. 4. This being the case, who were "the strange-faced people?" The answer is now clearer to me. That is, it took one year by boat to get to the land where men lived and made countries, southeast of where Woren lived. The names of their countries were also noted. They were the farthest lands that people mentioned in Sangouzhi , and the other ancient Chinese history books did not write about it in Shiji and Hanshu . Consequently, Louguo and Heichiguo also belonged to a part of the great land where "the strange-faced people*6)" lived. They were ancient Native American who lived in the New Continent. The elders of Sushen called them "the strange -faced people." This is my new theory. 5. In this theory we should learn how people recognized these countries. The elders of Sushen , did not say "From which direction dose the Sun rise?" as perceived from only one place (for example Vladiostok) they lived. They talked about it using only the common sense of Sushen . It was regarded as the great area of ancient culture which spreads over the northeast area of the Present Russian Republic. The large ice fields spread over from the Behring Strait to Alaska. Therefore it was called the New Continent based on their common sense. To say the least, the people who lived near the north border of the New Continent could keep in touch with their environment. We can easily imagine that they went hunting beasts on ice fields, slide over the snow in sledgs and entered Alaska through the frozen Behring Strait in winter. If anyone insists that " They had no knowledge of Alaska," I assure you that he is selfrighteous. Besides, there is the Sea. In the southern part of the Behring Strait flows the North Pacific Current. It is the extension of the Kuroshio , It goes southward, becomes the California Current, and reaches the distant part of the sea that it still visible from the northwest shore of South America (Ecuador and Peru). There it collides with the Humbold Current coming from the north, that is the largest cold current on earth. This makes for the greatest fishing ground. I cannot believe that the fishermen of Sushen did not know about the existence of the great fishing ground in the south sea. Because they could have the inshore fishing from the southern area of the Behring Strait to the greatest fishing ground. We cannot deny that the people of Sushen knew about this. On every occasion, the elders of Sushen stated that the New Continent and the existence of "the strange-faced people," were ancient Native Americans. They stated this fact to the Chinese. On the other hand, Woren also knew about the existence of the continent and two countries. They mentioned this fact to the Chinese. Subsequently, the Chinese became aware of the existence of the New Continent, by the elders of Sushen and Woren . Therefore they recorded two sure news in their historical books Sanguozhi . 6. Hanshu , the famous Chinese historical books were written in the first century before Sanguozhi . In it we can find the sentences : "There is a country called anxi in the west of Xiyu (the West Area). The elders of this country are said to have heard that " There is a country called Tiaozhi which takes more hundred days by foot from our country. Furthermore in the west,the place where the Sun sets takes a hundred days by boat." Probably Anxi is called Persia (ancient Iran). Tiaozhi is called Turk or Arabia (or northwest Africa). It cannot be disputed that only the sea exists west of Tiaozhi . The area where the Sun sets is far away from this country, because, as you may recall, the place where the Sun sets takes more than a hundred days by boat to get there. Therefore we cannot but regard the area*7) where the Sun sets as the New Continent or, at least, the east area of the New Continent. In China, formerly they had believed that the Sun set in Kunlunshan . In the first century B.C., Wudi , the emperor of the Han dynasty, sent Zhahggian to Xiyu (the West Area). He believed that the old dished view of Kunlunshan was incorrect. In Shiji , the most famous historical books in China. Simagian , the author, wrote about the emperor's contention proudly. Han , the new dynasty dispelled the ideas held concerning the Xia , Shang , and Zhou dynasties with their own traditional beliefs. This is the same method they used to maintain the belief that the Sun rose in the east island where Woren lived. But the Wei dynasty sent its army to the border of Sushen to fight against Gaogouli , and its envoy to Woguo (ancient Japan). A commander (Zhangzheng ) was also sent to help Beimihu , the queen of Waguo and was made to remain with them for twenty years. Subsequently, they were taught by Woguo (a big group of ancient Japanese). In the southeast, far from Woguo , the land where the Sun shone and men lived actually existed. Consequently the Wei and Xijin new dynasties could correct "their mistaken notion" of the Xia , Shang , Zhou Shu , Gin , and Han dynasties. This is how the "Discovery of the New Continent" was written in the Chinese historical books Sanguozhi in the third century. 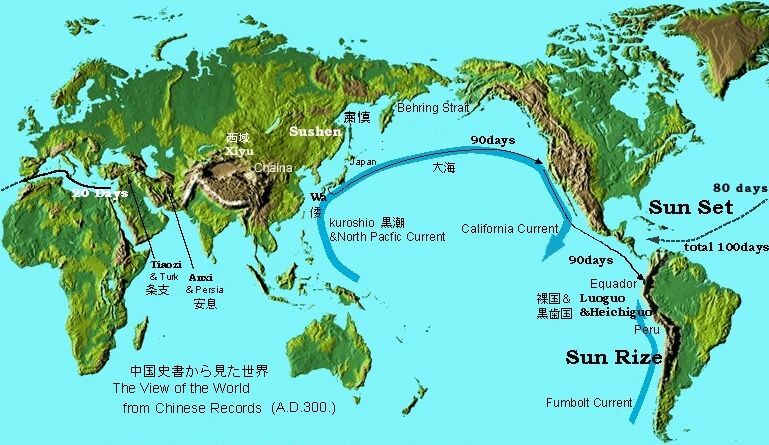 (1) It has been confirmed that exchanges between the Japanese Islands and China (the area of Jiangnan ) took place in about 5500 B.C., (A large quantity of Shijue ) were excavated at the ruins of Hemudu near Guijishan . They belonged to the same ancient civilization as Ketsujyo-mimikazari in the Japanese Islands). (2) It has been proved that exchanges between Vladiostok and the Japanese Islands (Shimaneken and Hokkaido and Aomoriken ) occurred between about 2000.B. C. - lOOO B.C. 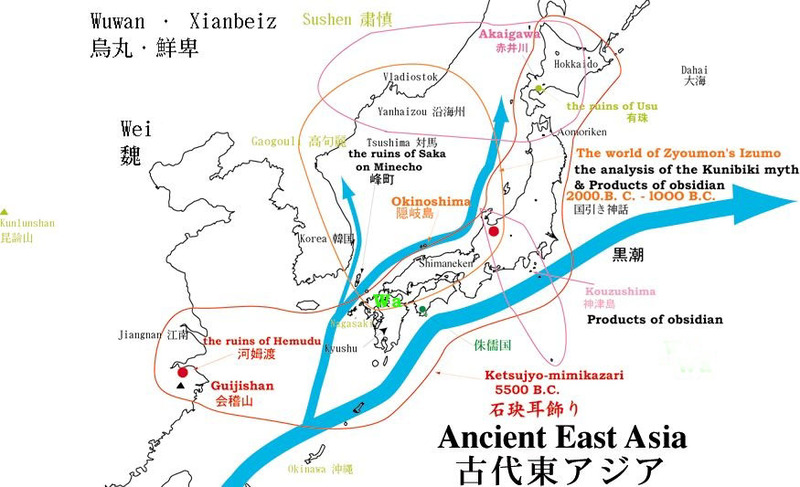 (Products of obsidian that were excavated from the ruins within 100 kilometers around Vladiostok, were brought from Okinoshima in Shimaneken << about 50% of them>> and Akaigawa in Hokkaido << about 40% of them>>. This was verified by an inspection of optical science). In reference to this point, I had already announced the result of the investigation mentioned above at the symposium in Izumo (Shimaneken ) through the analysis of the Kunibiki myth. My theory was confirmed. (3) Then, during the same period, it has been proved that exchanges between Tsushima (the island between Korea and Kyushu ) and Hokkaido or Aomoriken . (The shell ornaments and primitive harpoons unearthed from the ruins of Saka on Minecho in Tsushima were clearly special products of the northern area around Hokkaido . (4) It has been confirmed that exchanges between Hokkaido and Nagasaki ken and Okinawa island occurred in the first and fifth century. (The proof of this are the ornaments of the Gohora shell which have been excavated from the ruins of Usu in Hokkaido . This shell is a special product of the southern area in Okinawa and other locations further south. In addition, Nagasaki ken is regarded as the place of production of these ornaments). As a result, traces of an ancient people who used to set out on the ocean by ship, appeared one after another. They often set out across the ocean currents. "They could set out across a part of the Kuroshio ocean current. Why could' t they reach the west coast of Ecuador and Peru? They could reach them because of the strong Kuroshio main ocean current." Formerly many scholars had denied and sometimes decried the reality of the descriptions of Louguo and Heichiguo (in Worenzhuan ). They had judged them to be extreme and irrational, out of the bounds of possibility. But recently, various facts in the fields of historical literature and archaeology have been uncovered. Because of this, men can hardly maintain the old customs of denial which they had clung to in the past without, of course, being labeled peculiar bigots. (1) The description of Louguo and Heichiguo is real. They help to explain how the countries in the northwestern part of South America were before the third century. (2) It has been established that "the strange-faced people" written in the preface of Sanguozhi (Dongyizhuan ) showed people, in the New Continent, ancient Native American. (3) The Chinese heard the news, once from Woren , and another time from the elders of Sushen , in the northeastern area of the Russia Republic, including the Yanhaizou . Both pieces of news did not originate from the same source. However, both confirmed the fact that the place where "the strange-faced people" lived was in the east. The Chinese understood this and recorded the information in Sahguozhi . (4) It has been proved by the last several discoveries of archaeology that several thousand years ago ancient people had already set out for voyages across the ocean intentionally. Therefore we can hardly doubt the validity of the description in Sanguozhi . Judging by these facts mentioned, it can be asserted with certainty that there were exchanges between the continents in the Pre-Columbus period. The glorious memory of scholars has revealed this to the world. Of course, the meaning of the brave act by Columbus on human history cannot be neglected. However, at the same time, we can hardly dismiss the meaning of real human exchanges in the Pre-Columbus period. 9. Twenty years ago I regarded the voyages of Woren over the Pacific Ocean as a real historical fact. Many scholars laughed at and ignored my theory, however, only two scholars did not. They were Mr. Clifford Evans and Mrs. Meggers Betty J. in the Smithsonian Contributions to Anthropology, Washington D.C. They had profound knowledge through their research and investigation with Emilio Estraba (Ecuador) for many years. They gave me erudite support on my hypothesis which was based on records. Mr. Evans has died. However, study lives forever. He followed the road of truth as real cultured adventure. In the near future their discovery will become evident to everyone. I will dedicate this essay to them before that day comes. I feel happy and honored to do this. It is with sincere gratitude that I applaud all scholars before me for opening the door to a wider and deeper appreciation of cultural and historical truth. Chinese authorized history books (edited by Chenshou of Xijin in the third century). They have two prefaces: one is appended to Wuwan,Xianbeizhuan , the other Dongyizhuan . Worenzhuan is included at the end of Weizhi . To be more precise syuzyu-koku lies in the southeast of Woguo. Louguo and Heichiguo are in the southeast of syuzyu-koku . It is the ancient calendar which regards one year in the present calendar as two years. Chinese dynasty in the third century (265-316). "There was no 'Jamataikoku ' 1971". The phrase American Indian is improper as it is generally known today. Concerning of the voyage of Columbus, it took about 70 days to reach the New Continent, according to The Journal of "Christopher Columbus. " There is Japanese mixed with English in this paper.